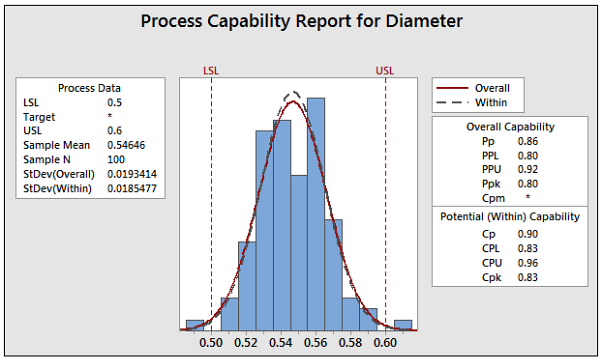 Minitab's capability analysis output gives you estimates of the capability indices Ppk and Cpk, and we receive many questions about the difference between them. Some of my colleagues have taken other approaches to explain the difference between Ppk and Cpk, so I wanted to show you how they differ by detailing precisely how each one is calculated. 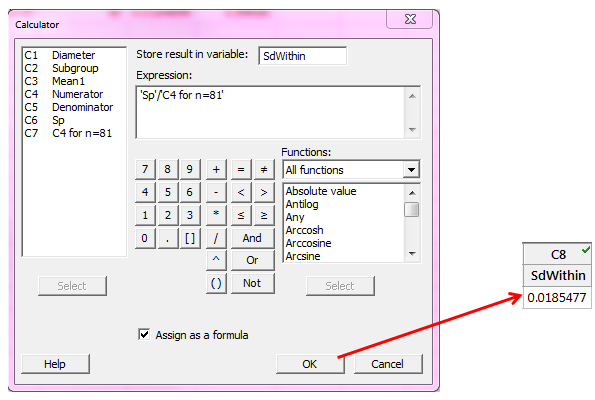 When you're using statistical software like Minitab, you don't need to do these calculations by hand, but I also want to lift the lid off the "black box" to show you what Minitab does behind the scenes to provide these figures. In my previous post, we saw how Ppk is calculated. 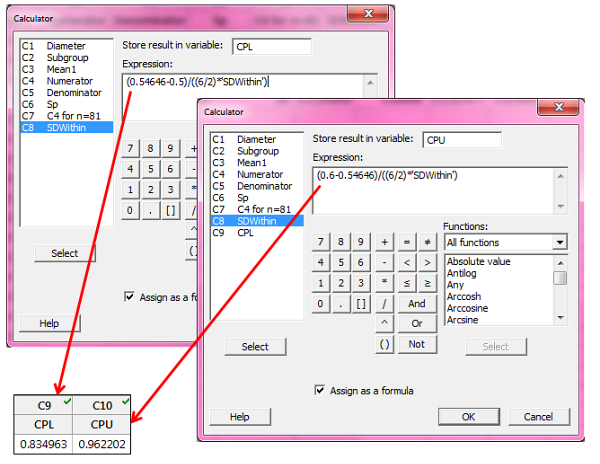 This time, we'll go through the calculation of Cpk, using the same sample data set in Minitab. Go to File > Open Worksheet, click the "Look in Minitab Sample Data folder" button at the bottom, and open the dataset named CABLE.MTW. This looks a little intimidating, but you’ll see it’s not so bad if we take it one step at a time. First, we’ll calculate Sp. For this example, the subgroup size is fixed at 5. We’ll begin with a clean worksheet containing only the Diameter data in C1. With 100 data points and 5 points in each subgroup, we have 20 subgroups. 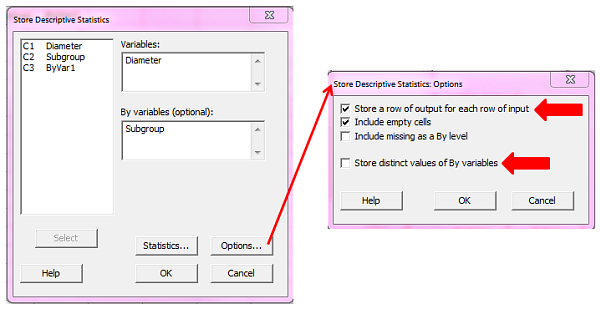 We then click Options and choose Store a row of output for each row of input, uncheck Store district values of By variables, and then click OK in each dialog box. 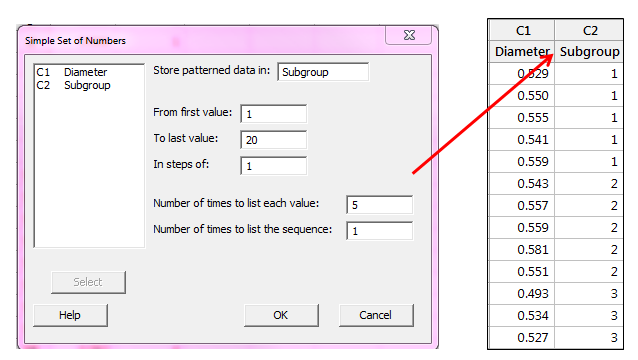 Now column C3 will show the average of each subgroup; the first 5 rows from C1 were used to calculate the mean of those first 5 rows, and that same mean value is displayed in the first 5 rows of C3. We are summing the squared differences between each measurement and its subgroup mean. 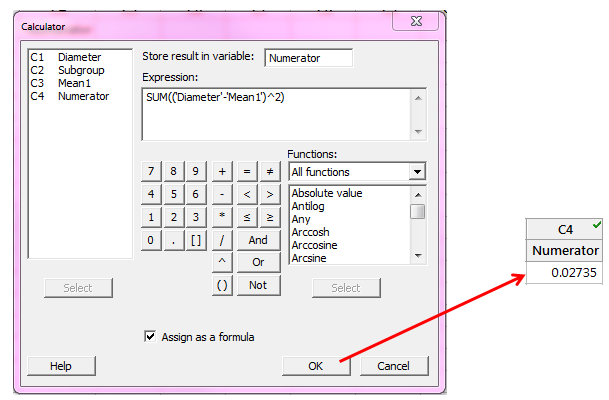 The Numerator column in the Minitab worksheet will show 0.02735 using the formula above. 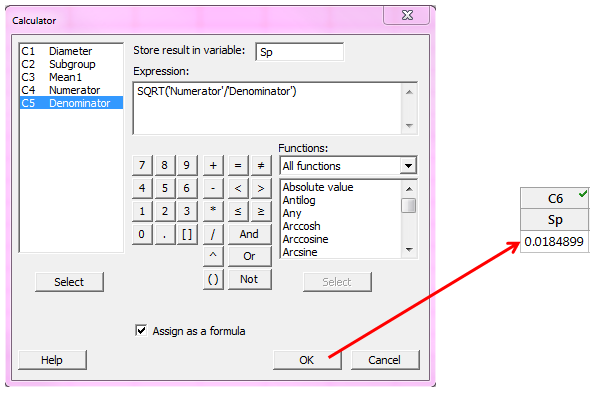 Notice that the Sp value 0.0184899 is the estimate of the subgroup standard deviation if we tell Minitab NOT to use the unbiasing constant, C4, by clicking the Estimate button in the Normal Capability Analysis dialog box and then unchecking Use unbiasing constants. 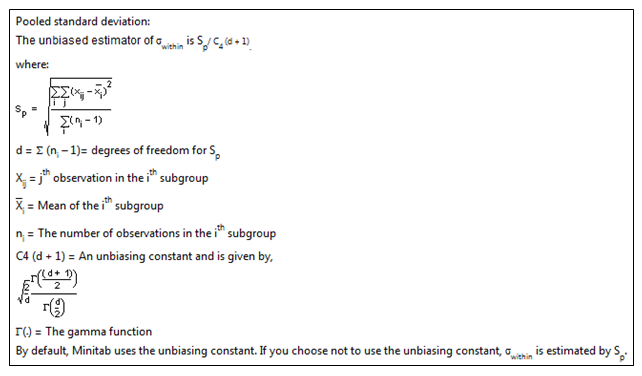 Now to finish calculating the within-subgroup standard deviation using C4 (the default), we can look up C4 in the table that is linked in Methods and Formulas under the Methods heading. We can see that this value matches the output from our initial capability analysis graph. 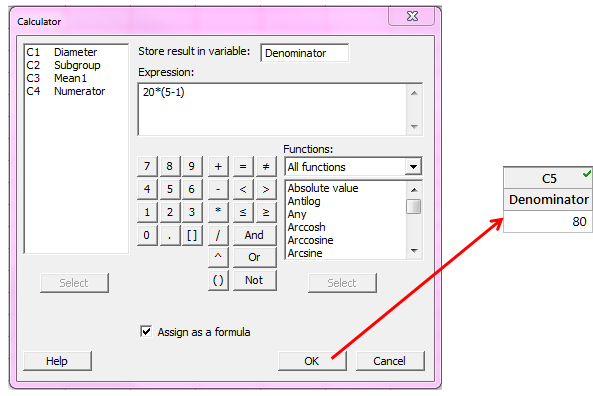 As long as you're using Minitab, you won't need to calculate Ppk and Cpk by hand. But I hope seeing the calculations Minitab uses to get these capability indices provides some insight into the differences between them!